Using machine learning to predict how nanoparticles will react in the human body. Some of the biggest advances coming in modern medicine may also be the tiniest. 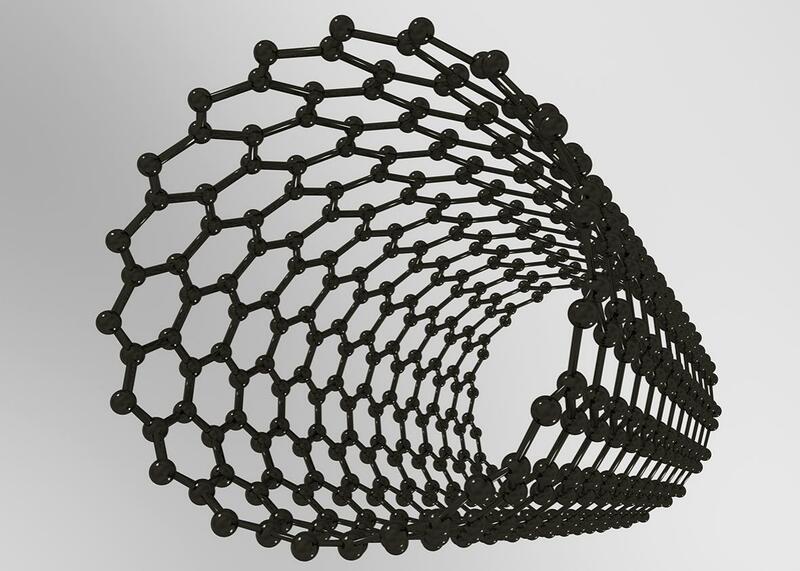 A 3-D model of a carbon nanotube. For a few decades, scientists have been learning how to design molecules that can operate in the human body. We’re talking about tiny particles that can manipulate biological processes—designed to bind to and thus block the enzyme essential for HIV replication, to help destroy tumors but not healthy cells, to weld together arteries after surgery. On this small a level, also known as the nanoscopic scale or nanoscale, chemists are building and manipulating matter as small as atoms, small molecules, proteins, antibodies, and DNA bases that are less than 100 nanometers wide. These objects are much smaller than the cells in your body. Many are even tinier than the whisper-thin membrane that holds a human cell together. Using lasers to cook tumors sounds like a great reason to throw chemotherapy out the window, except that it’s nearly impossible to foresee all of the possible pitfalls of unleashing particles so small. There are countless different substances in each human cell, and it’s very hard to check how a molecule would interact with every one of them. Chemists are good at predicting narrower outcomes, such as how a particular molecule will work on its intended target, but they have had to resort to rough approximation to try to predict all of the possible interactions new nanoscale creations would have throughout the body. For instance, one particle turned out to be remarkably sticky. A whole blob of proteins stuck all over the particle like hair on a ball of tape, keeping it from even reaching its target. There have been a number of success stories in which scientists were able design and release new molecules with confidence, as with the HIV drug Viracept. But the difficulty of computing the myriad of possible interactions has been the major limiting factor stalling widespread use. It’s not all sunshine and cancer cures. Nanoparticles have real risks. In earlier days, scanners could only recognize letters of specific fonts. Today, after feeding computers tens of thousands of examples of handwritten digits to detect and extrapolate patterns from, ATMs are now reading handwriting on checks. In nanotechnology, the research is similar: Just like many slightly different shapes can mean the same letter, many slightly different molecules can mean the same effect. Setting up a computer to learn how different nanoparticles might interact with the complex human body can assist with what were previously impossibly complex computations to predict billions of possible outcomes. A good example is an experiment carried out by the University of California, Los Angeles’ Rong Liu and his colleagues, published in 2011. This research team studied metal oxide nanoparticles—think tiny spheres of rust. These particles are potentially useful for MRI scans; they can provide contrast, giving doctors a clearer view of what’s going on inside the body. This makes it easier to diagnose disease or damage. The researchers put different varieties of these particles in petri dishes with cells taken from human throat lining. The team observed which particles damaged the cells’ membranes, and then divided that data into a training set and a test set. Their best model correctly predicted which particles would damage cells in the test set. In fact, it predicted which particles would do damage with 100 percent accuracy. One hundred percent accuracy sounds like a great accomplishment. But machine learning experts get skeptical when they see performance that high. The problem is that machine-learning algorithms sometimes do well on the training set but then fail when applied to the new inputs of their first test. Or, even worse, they do well on the first tests for the wrong reasons. One famous example of this happened a few years ago when Google Flu Trends made waves for accurately “nowcasting” how many people had the flu. The initiative based its estimates on the patterns its algorithms had found in how search trends lined up with Centers for Disease Control and Prevention data on flu prevalence during a particular window of time. Although its real-time flu forecasts seemed to square with the numbers of CDC-tracked cases released with a two-week delay, its potentially life-saving predictive success didn’t last long. In fact, in subsequent years it failed rather dramatically. It turned out that the algorithm was simply recognizing terms that people search a lot in winter, like “high school basketball.” It was just a coincidence that the number of people searching about basketball and the number of people getting the flu matched up so well the first year, and unsurprisingly it didn’t work in the long term. A human would never make that mistake. It’s not to say that big data can’t be valuable, and advances in machine learning will absolutely lead to huge breakthroughs for nanomedicine. But it is reason to not turn the algorithms loose and let them do all the thinking, especially when the stakes are as high as letting new creations loose in our amazingly complex, fine-tuned human bodies. As the lower-stakes Google Flu Trends failure taught us, machines will need a lot more data before we can trust them to make predictions and, in some cases, a human hand to help transform the variables the machine starts with into more useful ones. Here it’s useful to think of the example of the spam filter, one of machine learning’s greatest successes. When programmers just threw the text of a spam email into a prediction function, it only learned how to stop messages with wording very similar to the training examples. Tell the function to take into account a wider range of variables, such as the number of dollar signs, or percentage of all-caps words, and they got a much higher success rate. The same goes for nanoparticles—the research done so far has shown that it’s not just crude variables such as size and mass that need to be taken into account but also properties such as texture, circularity, surface material, and surface charge that seem to be the best predictors of whether they will harm cells. And, although it’s difficult to generalize with this, letting the machines work with good data (and lots of it) seems to be more important than the learning algorithm researchers use. It gets back to why many machine learning methods take cues from the natural world—immune systems, bird flocks, and counting trees have all informed successful predictive processes. Nature is quirky and irregular. This is especially true on the nanoscale. Which is why systems that are themselves quirky, irregular, and shaped over time and trial may be the best way to understand it. It does mean, however, that we will have to wait.